Here we have a fractal pattern of equilateral triangles. The close observer will see that the image has a random mix of "up arrow" triangles and "down arrow" triangles. The "up" triangles are painted an optimistic orange-gold, while the "down" ones are a dour blue. I call this "optimist and pessimist". The background region (the sparse area between triangles) is green. 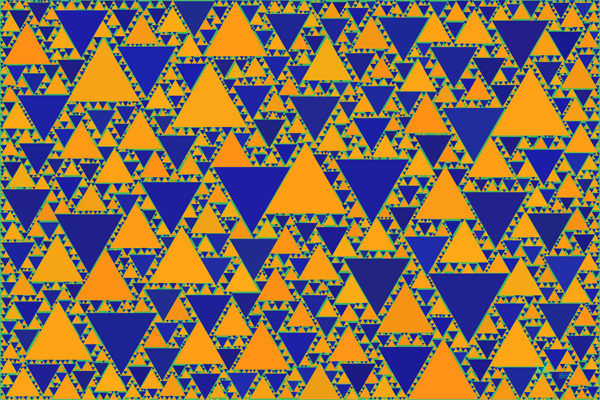 It is a curious fact about this pattern that the orange-gold "up" triangles are seldom adjacent to other "up" ones, and that the blue ones are also seldom adjacent to each other -- despite the fact that the positions are chosen entirely at random. Thus does order emerge from randomness.